As the month (August) comes to where we as fashionista’s go into hiding of beautiful vacation to recharge our batteries and plan our fall closets. Whilst back of our mind we know when we get back it’s into the fashion night out’s events and along with that we elegantly place ourselves onto, the fashion month carousel of the spring and summer 2013 season. 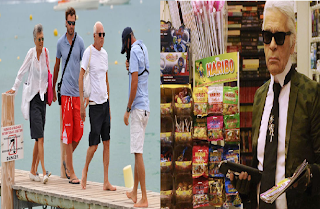 Ahead of august it looks like Mr. Lagerfeld and Mr. Armani (the fashion grandees) have beaten us all to the beach ahead of the vacation break. 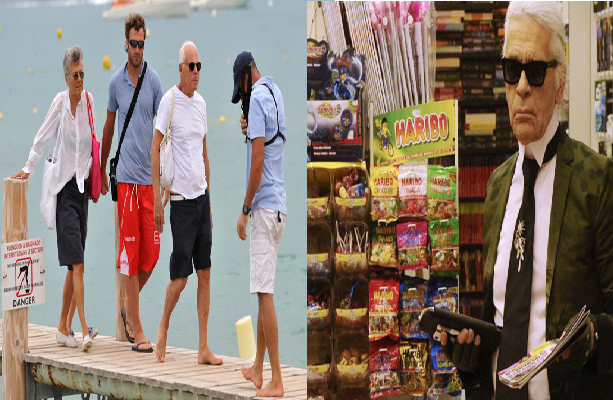 They both have come to St. Tropez to spend some time out of the fashion world. Mr. Armani was seen looking causal in chinos and sporting a fine white tee and rope handle bag, stepping on to a yacht working nautical style with aplomb. However Mr. Lagerfeld’s vacation outfits have been kept under the casual radar instead he has gone for his classic monochrome suit under the St. Tropez heat. Instead of sweating like other mortal’s do. Mr. Lagerfeld kept himself clam and cool has he was spotted in a newsagent, with gossip magazines. Whilst sporting his classic monochrome suit. Writing this post really makes think about having just one more day to go until I’m off for my own summer vacation ahead of September’s SS13 season. * Images Grazia. Myself have put the two together, so you can see both pictures.